Potting Compounds on mixing with hardener at ambient temperature results in a hard, flexible cured mass with a low exothermic rise in temperature. Our company welcomes you to the house of quality chemicals. We value your time and will provide with all the necessary information about the company. Padmavati Resins Pvt. 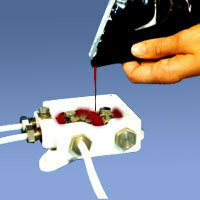 Ltd manufactures a wide range of polyurethane and epoxy compounds since the last decade albeit with a different name. The products we offer to our clients are polyurethane compounds, epoxy potting compounds, polyurethane potting compounds in many parts of your life be it electrical motors that are used, the vehicle driven, the air-conditioners that are used or even the place you stay in. We have been very keenly centering on offering the highest quality products to all our clients at a very reasonable price range that has helped us carve a highly regarded position for ourselves in this competitive market.